Baltimore Ravens star linebacker Ray Lewis recently read the story I wrote about my son’s football dreams and decided he wanted to come watch him play yesterday. Well, ok, maybe that’s not exactly true but he did come to a game and saw my son. 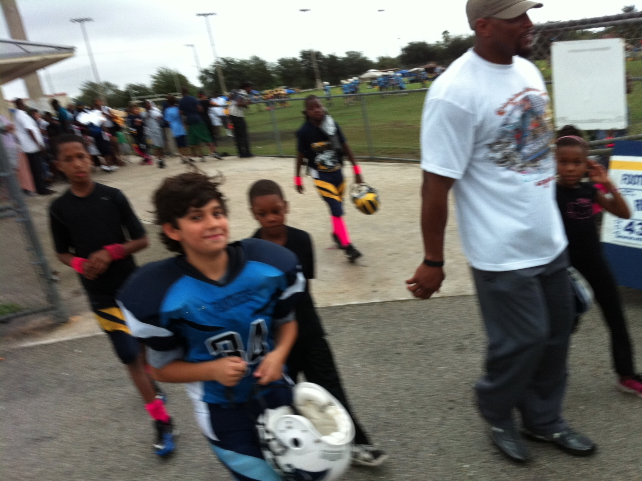 Mr. Lewis’ own son was on the team that played my son’s team and got blown out 26-0. My son is allowed to play in blow outs so technically Mr. Lewis saw Jonathan take the field. After the game, my son begged me to take a photo of him with Mr. Lewis but that was gutsy of him because my son was still wearing his opposing team football uniform and Mr. Lewis was giving the defeated team a pep talk. 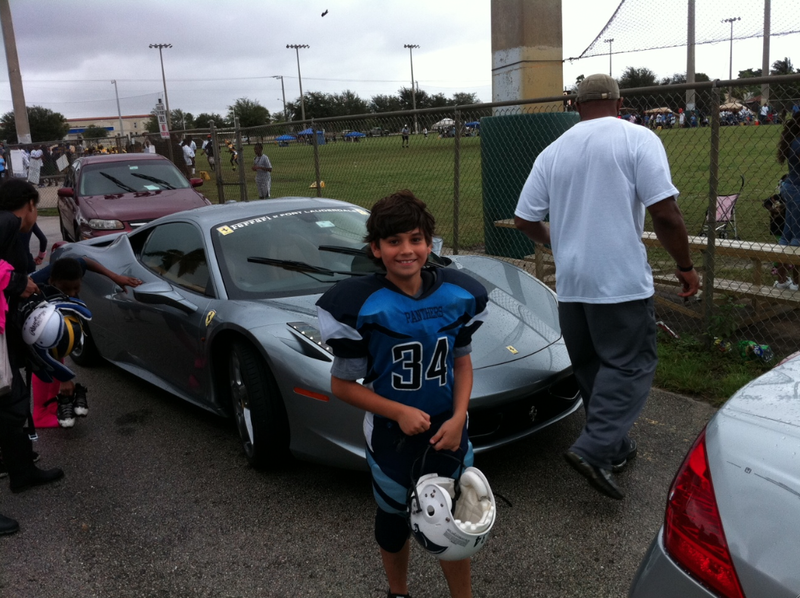 As soon as Ray was done, my son pretty fearlessly approached Mr. Lewis as he walked briskly to his Ferrari with his son. When my son asked him for a quick photo Lewis graciously shook Jonathan’s hand and asked him for his name but he didn’t pause. Fearing that a throng of other people would hunt him down for photos and autographs, Ray politely told us he couldn’t pause but didn’t mind if we took some photos of him walking back to his car. I took a couple of blurred shots of him with Jonathan and then told my son we also had to leave. 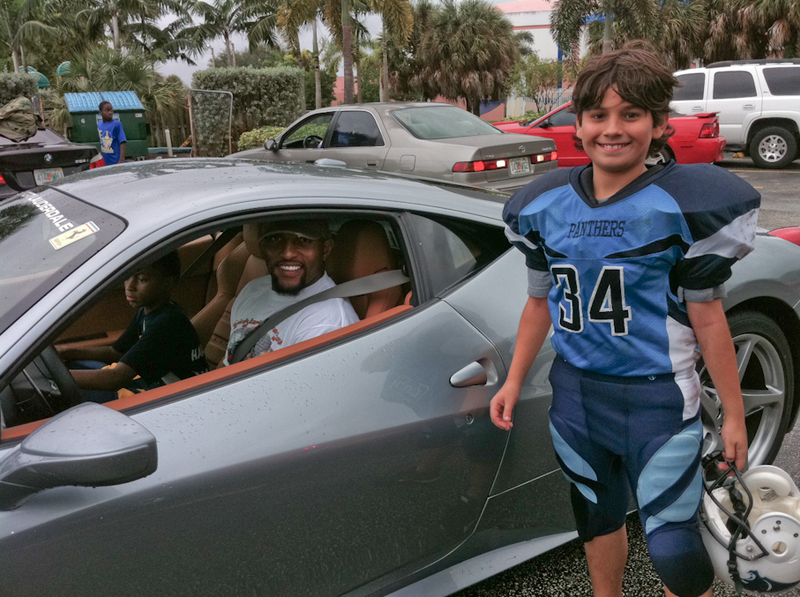 Minutes later my son and I prepared to board our car when lo and behold there came Ray Lewis, quietly behind our car inside his Ferrari. He motioned to my boy and I to come over for the photo we couldn’t get earlier. My son rushed to Ray’s side of the car, they both smiled and I snapped this quick photo you see above this story. This football season has had a lot of pleasant surprises. This is just the latest chapter.